Dubbed as the Battle for the Umami Bowl, the Ajinamoto's 3rd Umami Culinary Challenge will be on January 20, 2012, from 8:00 am to 6:00 pm at the SMX Convention Center, Mall of Asia. This inter-school culinary competition, which is the first of its kind, will showcase 29 universities and colleges offering HRM and Nutrition course as well as well-know culinary schools. Judging the competitions are Sandy Daza (Inquirer columnist and TV show host), Chef Babes Austria (Executive Chef of Taal Vista Hotel and former Executive Chef of Malacañang Palace),Chef James Antolin (Vice President of Pastry Alliance of the Philippines), Chef Day Salonga and Chef Mon Acosta (Chef Consultants for opening new restaurants), Nina Daza-Puyat (Editor in Chief, Appetite Magazine), Chef Seiji Kamura (Executive Chef and owner of Mogu Japanese Restaurant), Vicky Alejandrino, (Head of Quality Assurance and Commissary for the Pancake House Group), Chef Colin McKay (Executive Chef and owner of Sala Restaurant Group) and Tetta Arroyo (Travel and Food Writer) among others. 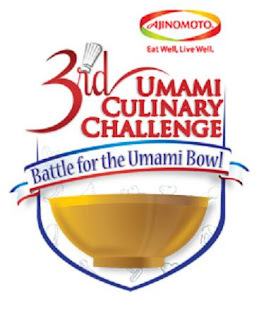 The Ajinomoto 3rd UCC: The Battle for the Umami Bowl is a collaboration of organizations which strongly support the development of the Philippine culinary scene, among them are Glutamate Association of the Philippines (GAP), Elba, Whirlpool/Fujidenzo, Masflex, PR Gaz, Meat and Livestock Australia, and Anvil Publishing and media partners GMA 7, Appetite Magazine, Philippine Daily Inquirer, Inquirer Libre and PR Moms Network.